Making typos is a typical problem with Smartphones or tablets. If you’re using a virtual keyboard on the touch display, you can feel this issue. To come out of this trouble, a new Ultra Thin Bluetooth 3.0 Wireless Keyboard has been rolled out. The name of the keyboard is Rapoo E6300 Ultra-Thin Bluetooth 3.0 Wireless Keyboard. It is a good solution for your typos. This keyboard titles the world’s thinnest as it measures 5.6mm (0.22?) and looks more compact to keep in your pocket for making your work on the go. 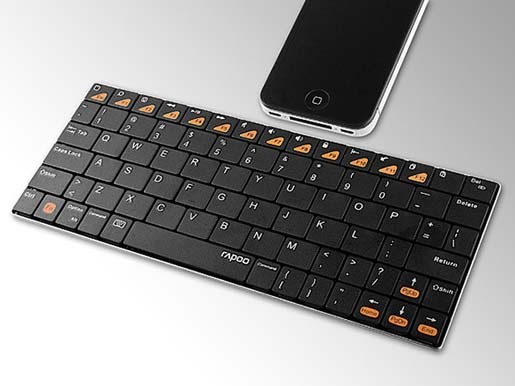 You can use this keyboard with cell phone, tablet or any other portable electronic device. The Bluetooth range of the keyboard is 30 feet. It is rechargeable with a battery life of about a month. • Specifically designed for the iPad and Android users. • Suitable for smart phone, tablet, iPhone series, iPad series, laptop computer, etc.